" I grew up watching Reading Rainbow, LeVar's soothing voice helped my love of books grow throughout my childhood." I feel like LeVar inspired many of us to pick up a book and use our imaginations. Just a few years ago there was a Kickstarter to bring back Reading Rainbow, and my husband and I backed it. I believe it was also the highest amount raised for any Kickstarter at the time. 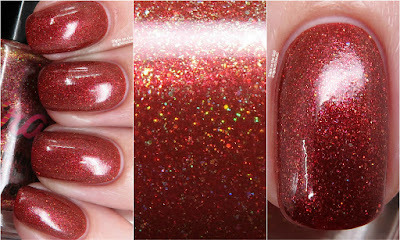 Polish Pickup will open up at 11:00 ET AM on May 3rd and will run through 11:59 PM ET on May 6th. Lotion of Immortality is a thick moisturizing lotion that is perfect for the cuticles, hands, or the body. It is made with shea butter, aloe, and love. It is very emollient, but does not leave you greasy at all. Each jar is 20 g which is plenty for the cuticles and hands. If you put it all over your body, it obviously won't last as long, but a little goes a long ways. Instead of the usual shimmer included in each trio, a small container of gold holo butterfly glitter was this month's addition. You can use it in your favorite nail polish, or hand-place it on your skin or mani. If you use it on your mani, it is recommended that you use at least 2 coats of top coat to smooth it out. Take a Look, It's in a Book: described as an endless room of books on dusty shelves, and all the time in the world to read them. It has the barest notes of sandalwood, vanilla, and tobacco. This one is extremely complex, and is definitely a warm, rich scent. Butterfly in the Sky: I can go twice as high! Fresh air & floral. It includes notes of hibiscus, rose, juicy plums, and fresh mountain air. The rose is what I noticed first, but not in a bad way. Some "clean" scents can give me headaches, and this one didn't do that. It's a clean, spring-like scent. Secretly a Starfleet Officer: Patchouli, lavender, chamomile, and apricots. It includes notes of musk, leather, and a gentle powdery freshness. I know that patchouli is a polarizing scent, and while you can tell it's in there, the lavender and fruit really evens it out. I had my husband smell this one, and he immediately put it on his hands. This is the most "masculine" of the scents, but definitely remains a unisex scent. Take a Look, It's in a Book is a tri-thermal that shifts from pale lavender (warmest) to periwinkle (medium) to bright plum (cold) with red/copper/gold/green unicorn shimmer, and teal/blue/purple color-shifting flakes. While I love it in the warm state, the real star is in the cold state when the flakes and shimmer really pop against the dark background. Truth be told, I didn't know this was a thermal when I started applying it, so I ended up using 3 coats because it was slowly transitioning to the warm state and I thought it was sheer. Oops. That said, you could likely get away with just 2 coats, but I used 3 from my confusion. It applied perfectly; just make sure that no rogue flakes stick past the free edge. It dried with very minimal texture, but I still recommend a good topcoat to protect the nails. Oh, I also used the Lucky 13 Lacquer Elemental Ward top coat for my photos which retails for just $5 and comes in a variety of scents (not available through PPU). There you have it, everyone! This was my first time trying the Lotion of Immortality, and I was extremely impressed with the longevity and the level of moisturization it provided. The polish for the month was extremely unique, and chock full of fancy ingredients (tri-thermal, unicorn shimmer, flakie, oh my!). You can find out more about Lucky 13 Lacquer on their website, Facebook Group, or Instagram pages, while you can find more about PPU on their Facebook page and website. Hi guys! I'm really loving these short work weeks, so I'm going to be very disappointed next week. Tonight I've got the next installment of the California Lovin' Indies Collaboration box where Stacy from Static Lacquer works with other indie brands in the great state of California. I've noticed how many brands come from California, so I think this is a wonderful way for brands to join forces. 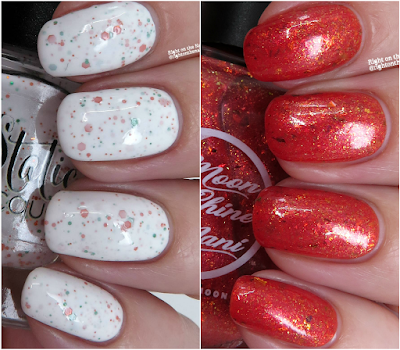 This month features Phoebe from Moonshine Mani and her popular YouTube channel. The duo goes on pre-order Friday, April 19th at 8 AM PST through Monday, April 22nd at 11:59 PM PST in the Static Lacquer website. The duo will retail for $22 + shipping and will also include a holo vinyl sticker and a 4-piece set of magnets (shown below). 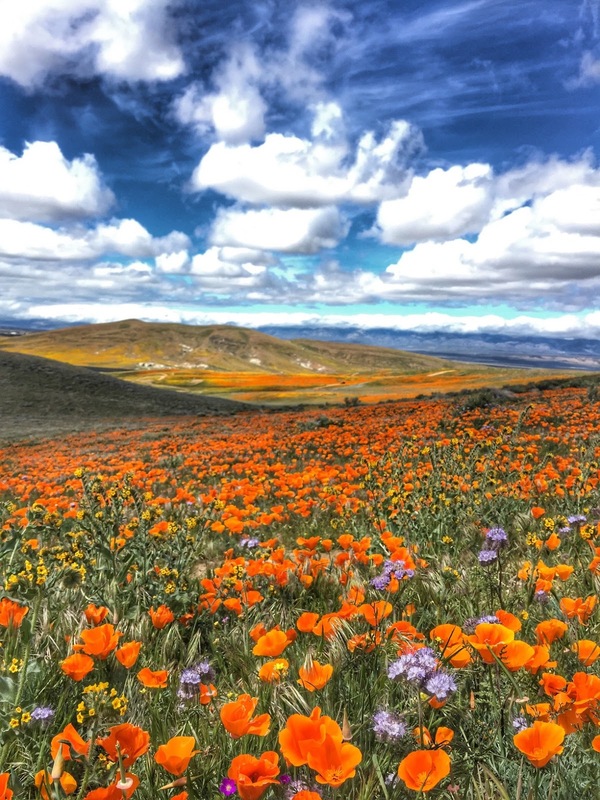 Stacy and Phoebe took inspiration from the blooming poppy field reserve in Antelope Valley. They discovered in their talking of inspiration that they actually lived in the same place just at different times in California. It's such a small world, isn't it? 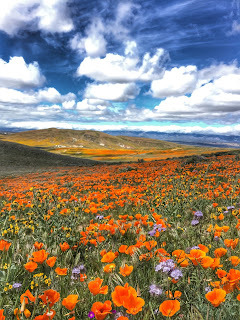 The California state flower is the poppy, and I've been lucky enough to visit the state many times to enjoy these beauties. I grew up used to the red poppies, and was pleasantly surprised at the orange variety in California. Did you know that there are over 120 different varieties of poppies? Antelope Valley Reserve contains over 1700-acres of land and is part of the Mojave Desert. Has anyone been there? Each duo purchased will come with 4 mini magnet cabochons painted with the 2 polishes (2 of each kind). They are smaller than a penny, and perfect for your Helmer or refrigerator. Up first from Moonshine Mani is Antelope Valley Gold which is an orange jelly base with gold shimmer and orange/yellow/green iridescent flakies and red/bronze/copper ucc flakies. It fully covered in 3 thin coats since it's a jelly, and it had a perfect formula. If you use thicker coats, you may be able to get away with 2 coats. It dried to a semi-glossy finish with no discernible texture. I love orange, so I knew this duo was going to be right up my alley. I love a good white crelly polish, and Stacy gave us a beauty. Poppy Fields is a white crelly base with different sizes of orange and green hexagonal holo glitter. I'm used to polishes like this needing 3 coats, but this one was very opaque and needed just 2 of them. It dried with a satin finish with minimal texture despite the abundance of glitter. Don't forget, this set goes on pre-order Friday, April 19th at 8 AM PST through Monday, April 22nd at 11:59 PM PST in the Static Lacquer website. I really appreciate that Phoebe and Stacy took 2 very different finishes to make this duo, and the mini magnets really adds a personal touch. You can check out Static Lacquer on their website, Facebook, Group, and Instagram pages while you can learn more about Moonshine Mani on their website, Facebook Group, and Instagram pages. Hi guys! I know it's been a little quiet here, but I've got a few more collections up my sleeve. It's finally spring here in NC, and I'm loving every minute of it. I've been busy at work, and was in Atlanta last weekend for their pen show. I had a good time, but it's always tiring with all that travel. 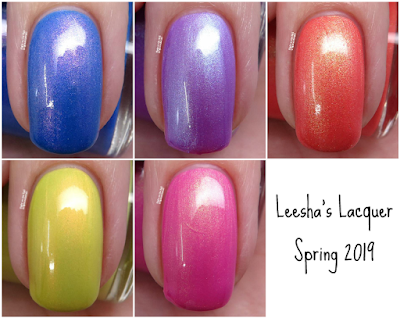 Tonight I have the long-awaited spring collection from Noodles Nail Polish to share with you. Natalie has said that spring is her least favorite season to make polishes for, and you'd never know it from looking at this collection. This is a 6-piece collection featuring glitter crelly pastels, flakies, and contrasting glitter combinations. These will be available this Friday, April 19th at 6 PM ET on the Noodles site. All but Flower Child ($10) will retail for $9.50 each. Hi guys! I've got a quick post to share with you tonight. 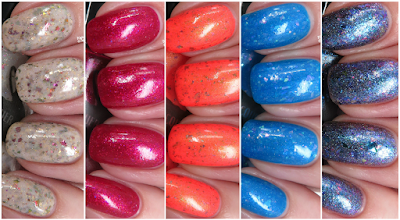 Chirality Polish has an April exclusive for the Polished Gamers Facebook Group. It will be available through the end of the month, and you must be a member of the group in order to purchase it. All orders will be compared to the member list, so please list your Facebook name (if different) in the notes section on your order. It's 10-free, and retails for $10 for a full-size bottle. This one is inspired by the game Fable 3, and I just so happen to be a huge fan of the game. I would make my husband a ton of money in the game by doing monotonous jobs like chopping wood, bar-tending, and forging swords. Apparently I have great patience for menial things like that. Side Quest is a reddish orange base with gold holo glitters, red to gold shifting pigment, and gold shimmer. The gold shimmer really stands out in lower light, while the holo glitters sparkle in the sunlight. I used 2 thin coats for my photos, and it applied easily. It dried with a tiny bit of texture due to the glitters, but it smoothed out with a layer of topcoat. Gamer or not, you'll enjoy this glittery shade. Make sure to join the group to see some cool nail art and buy some monthly exclusives. You can find out more about Chirality Polish on their website, Facebook page, Facebook Fan Group, and Instagram pages. Hi guys! I told you I'd be coming at you with a lot of posts. Now you can't get rid of me! I've got more bright and colorful spring shades to share with you. I'm so excited that Leesha's Lacquers made a whole collection of contrasting shimmers! I've been asking for this for years because I can never get enough of them. This 5-piece set will debut at Polish Con this Saturday and online on Monday, April 8th at 6 PM CT on the Etsy page and website. Both full-size (15 mL) and mini (7.5 mL) bottles will be available for $10 and $5, respectively. Shall we get a closer look at these lovely polishes?